Key Difference: There are eight different types of pollution: air pollution, water pollution, soil pollution, noise pollution, radioactive pollution, light pollution, thermal pollution, and visual pollution. Everyone has heard the term pollution constantly – either in school or documentaries or random pamphlets. With the global warming taking center stage and becoming a prominent issue, pollution has become one of the most important problems that is currently being tackled at a global level. Pollution can be defined as the introduction of contaminants to the natural environment, where the environment is affected negatively by the actions of humans. Pollution can take any form including chemical substances, heat, light, noise or energy. To make it easier to distinguish, pollution has been divided into eight categories by the scientific community. Air pollution is the contamination of the natural air by mixing it with different pollutants such as harmful fumes and chemicals. This contamination can be caused by gases emitted by vehicles or from burning material or harmful fumes emitted as a byproduct of industries. The higher the concentration of air pollutants, the harder it to remove it effectively through natural cycles. The higher concentrations also result in breathing problems for living things. Some effects include increase in smog, higher rain acidity, crop depletion from inadequate oxygen, and higher rates of asthma. According to experts, global warming is one of the biggest side effects of air pollution. 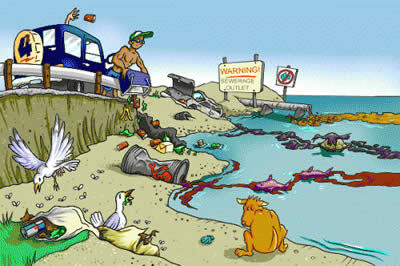 Water pollution is the contamination of the water on Earth. It includes contamination by pollutants such as chemical, bacterial or particulate that reduces the purity of the water. Oil seepage as well as littering is one of the most common forms of pollution. Water pollution occurs in lakes, oceans, rivers and even underground reservoirs. Water pollution is one of the most dangerous from of pollution as it decreases the amount of drinkable water that is available. It can also reduce the amount of water that can be used for irrigation as well as harm the wildlife that depend on the water. Soil pollution, also known as land pollution is the contamination of the soil or the land that prevents growth of natural life, which includes land used for cultivating, wildlife as well as habitation. Common causes of soil pollution includes non-sustainable farming practices, hazardous wastage and seepage into the soil, mining as well as littering. Soil pollution can result in reduced growth of agriculture as well as poisoning of the land and nearby water. Noise pollution is the loud noises that is created by human activity that disrupts the standard of living in the affected area. Pollution can stem from things such as traffic, railroads, concerts, loud music, airplanes, fireworks etc. Any noise that disrupts the ability of a person to perform can be termed as noise pollution. This can result in temporary or permanent loss of hearing as well as disturbances to wildlife. This is one of the most dangerous forms of pollution as it is extremely harmful and can even result in death. This type of pollution has risen in the 20th century with the rise of atomic physics and nuclear weapons. Radioactive pollution results in the pollution of the air and land with radioactive poisoning. It can happen from leakages or accidents at nuclear power plants, as well as from improper disposal of nuclear waste. This pollution results in birth defects, cancer, deteriorating of health and even death. Light pollution is the over illumination of a certain area that is considered as obtrusive. It is considered pollution especially when it interferes with astronomical observation. The most common way to determine if an area is polluted is to look at the stars, if you can see them your area is not so polluted. Pollution includes large lighted cities, billboards and other advertising, and nighttime entertainment. Thermal pollution is when the temperature increases in a particular area over time. This heat is often caused by air pollution and the release of carbon gasses in that area that traps more heat on the Earth. The earth has a natural thermal cycle, but excessive temperatures can result in long term effects. 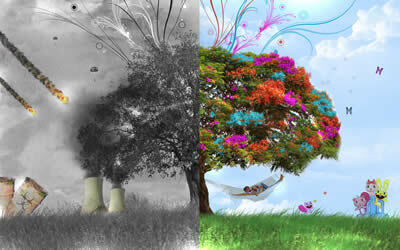 The rising temperatures can be a result of deforestation, power plants, high carbon footprint, etc. While, slight changes in temperature is common in nature, faster changes in the temperature can result in loss of wildlife as well as reduction of water. Although not a life threatening form of pollution, it can be considered as unappealing to the eyesight. This form of pollution is when there are obstructions to views caused by billboards, powerlines, construction areas and even high rises. It does not have immediate health effects but can have slow effects. All pollution is interrelated and indirectly can be a cause for each other. Such as air pollution has a direct relation to thermal pollution. Light pollution is caused by energy companies that require burning fossil fuels, which in turn increase air pollution, which in turn increases water pollution. As one can see, there is a correlation between all the types of pollution. Fighting pollution might seem like a daunting task for one person, even doing a little bit often helps. Reduce water wastage or consuming less light or even not littering can result in reducing pollution massively.